Plaques remembering International Brigaders at the Barcelona Synagogue. Photo Alan Entin. 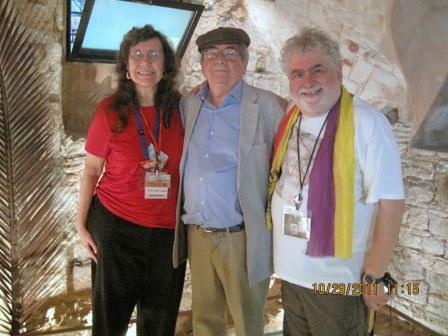 On a visit to sites important to the Spanish Civil War in October, 2010, Alan Warren took Josie Nelson Yurek, Parkie Parker, and me to visit the Ancient Major Synagogue in Barcelona. Historically, the Synagogue has roots dating back to the middle ages, although now it functions as a Museum in addition to occasionally holding religious services. While there, we met Miguel Iaffa, the director of the Synagogue. His father was a Brigadista from Argentina and is buried next to John Cookson, where Clarence Kalin has since been buried. 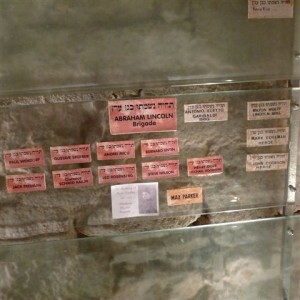 There we observed a Memorial with plaques bearing the names of several Lincolns and International Brigadistas. We spoke with Miguel about adding the names of our loved ones to the Memorial. Subsequently we undertook a fundraising event among the Friends and Family of the Abraham Lincoln Brigades to raise money for the Synagogue and erect plaques for our loved ones. We arranged with Miguel to have an dedication service and unveiling of the plaques when we were in Barcelona for the 75th Anniversary Commemoration of the start of the Spanish Civil War. Josie Nelson Yurek, Alan Entin, and Miguel Iaffa, Director of the Ancient Synagogue of Barcelona. Photo Henry Yurek. What started out to be a small, interdenominational service to remember and reflect quickly grew as others attending the Commemoration learned of our event and chose to join us. An international crowd of over 20, including many from Germany, France and Holland, who I knew from previous homenajes, joined us for the service. Those who had contributed plaques were asked to say a few wods about the contributions of the Brigadistas they chose to honor. The Kaddish, a memorial prayer for the dead, was recited in both Spanish and Hebrew, All present were deeply moved, and in tears, during the service. Many told me it was “the emotional highlight” of their trip to Spain. At the time of the event, seven individuals and families had generously chosen to become involved in the project. This furthers the work of the Associació Call de Barcelona in their Project searching a common objective: “Keep and pay homage to the righteous dead.” This is a nondenominational project, and the name of Andrew Micu, the Rumanian Brigadista who died recently, has been added to the plaques. Subsequent to our service, I am happy to report, many others have stepped up to add a name to the Memorial or just plain donate to further the important vision of the Synagogue. What a fabulous story; all the IB groups round the world should read it.